BEIJING - Debt issues will be a more regular option for China Life Insurance Co Ltd, the world's largest life insurer by market capitalization, to restore its claims paying ability amid a declining performance, a top executive of the company said on Wednesday. China Life recorded a 28.1 percent drop in first-half net profit to 12.96 billion yuan ($2.03 billion), despite 5.6 percent growth in total revenue to 227.47 billion yuan, according to the company's interim report. As of June 30, the insurer's solvency ratio, which measures its ability to pay claims, fell to 164 percent from 212 percent at the end of 2010. Chinese insurers must maintain solvency ratios of more than 150 percent, according to the China Insurance Regulatory Commission. The decline was mainly attributed to a drop in investment returns as a result of market volatility and rising interest rates in the second quarter, which reduced the value of the bonds the company held. 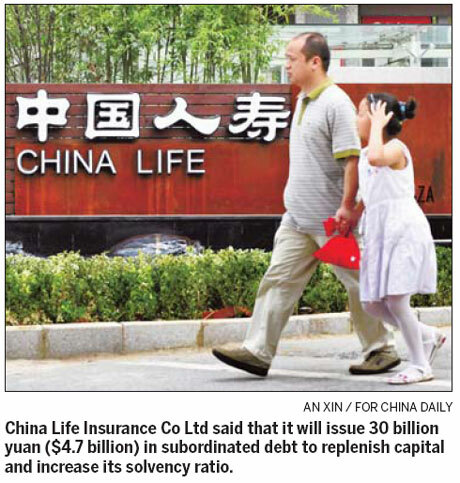 China Life said on Tuesday it would raise 30 billion yuan through an issue of subordinated debt to restore its capital level and increase its solvency ratio. "The debt issue will increase the company's solvency ratio by at least 40 percentage points," said Vice-President Liu Jiade on Wednesday, adding that debt issues will become more important financing tools for the insurer. "It is not a good option to raise money from the stock market, considering the performance of our shares and the complex approval process, whereas debt issues are easily approved and quickly supplement our capital," Liu said. "The 30 billion yuan debt issue is just a beginning. We'll make more such decisions according to our business development and the change in the solvency ratio," he said. The average percentage of money raised through bonds and other financing tools to meet solvency requirements ranges between 25 and 50 percent for global insurers, and this is considered the best proportion, according to Liu. "Thus the debt issuance is not only to restore our capital, but also to optimize the capital structure," Liu said. The insurance industry has raised more than 100 billion yuan through debt issues and other financing tools so far this year, Liu said. "The life insurance industry is facing a challenge of declining product attractiveness because of a rising interest rate, which led to a lower-than-expected performance," Huang Lijun, an analyst with Hongyuan Securities Co Ltd, wrote in a research report. "China Life shares will remain poor unless the stock market rebounds," Huang wrote. But Dou Zeyun, an analyst with Ping An Securities Co Ltd, expressed optimism about the company's outlook after the solvency ratio is improved by the debt issue. "Considering the great prospects of the Chinese insurance industry, China Life, as the leading company, will have smooth development in the long term," Dou said. On Wednesday, shares of China Life fell 3.34 percent to 15.63 yuan in Shanghai.